I can’t deny it, I am one hell of a sucker for TV talent shows. Not even the fact that I moved country has made me miss out on my favourite shows (thank you video streaming – not sure if the authorities will like that comment though). I have been an avid follower of Britain’s Got Talent and The X Factor for years now. I do watch the Irish equivalents from time to team but I do love me a bit of Simon Cowell and the lush specimen that is Dermot O’Leary has me tuning in religiously every week. I’m not very picky though and will give anything a chance so you can imagine my excitement when The Voice was thrown into my usual mix of reality offerings. As much as it hurts to admit this, last years X Factor was a bit stale. Louis spewed out the same ol’ lines, Kelly couldn’t have been more out-of-place than a nun in a brothel and Gary’s mean streak was a bit of a turn off. Tulisa was a pleasant surprise though. When I saw the adverts for The Voice I was enthralled. Four highly esteemed judges who could actually sing and no dud and utterly atrocious acts (Frankie Cocozza anyone). This was a talent show I simply couldn’t miss. I watched the first week and loved it. I watched the second week and was still on board. By the end of the blind auditions my interest began to dwindle a little and once the battles had commenced I simply wasn’t convinced anymore. Just one week into the live shows and the love and appreciation between myself and The Voice was truly dead. However, to BGT I am still fully committed. The fake bickering between the judges which they criticise for happening on the X Factor. We don’t want to hear it when we all know you are shamelessly promoting yourselves! What do you think? Do you like TV talent shows or have they seen their day? 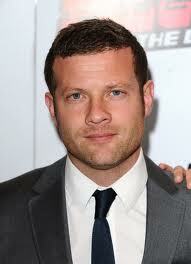 Ya gotta love a good Dermot picture!